We broke up with kombucha for a little while. Brews would be forgotten for too long, flavors were added at the wrong time and sad-looking SCOBYs (Symbiotic Culture of Bacteria and Yeast) and less-than-palatable beverages were the result. Then, it was all water kefir all the time, but I have a hard time keeping that up during the winter. Tibicos are fantastic for what I like to call a fizzy lifting drink, quite refreshing on a hot summer day, but not something I crave when the chill is on. So we broke up with those, too. It was somewhat liberating not to have any cultures to babysit (excepting the weekly batch of yogurt, which is very forgiving), but then some friends brought over a bottle of their homebrew cranberry kombucha and it was all over. We came crawling back, begged forgiveness and started over, with a bit more research and a lot more enthusiasm. The results have been super-tasty and we find ourselves with wonderfully healthy, rapidly growing mama mushies. Inevitably, if you’ve got a happy culture going on, you’ll have some extra to give away, feed to your chickens, or…experiment with. Enter the SCOBY Snack. If you don’t like gummy bears, don’t make this. It’s basically the most delicious apple-cider flavored gummy chunk you’ll ever put in your mouth. Seriously, I will take SCOBY donations just to make gallons of this stuff. All you need are your extra SCOBYs and a very simple sugar syrup. Sugar syrup: heat a 50/50 solution of sugar and water until the sugar is dissolved. 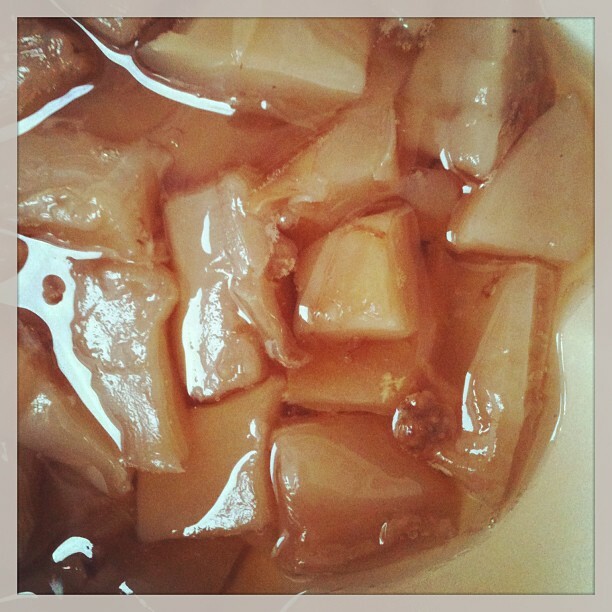 Cut your SCOBY up into one-inch chunks. You want about a 1/2-inch-ish thickness for best results. If you have a really thick one, that has been hanging out for a long time trying to become the size of your jar, you’ll need to slice it into rounds and then cut it up. Layer the chunks into a baking dish or bowl, sprinkling with a little raw sugar as you go. Pour the sugar syrup over the chunks until they are mostly covered. If you have a dehydrator, spread the chunks out on a fruit leather sheet and set to a raw food temp (I used 115 degrees). Dehydrate until you’ve got gummy bear texture. So far, I’m storing my finished snacks in a glass jar at room temperature. I don’t they’ll last more than a day or two. If you are using an oven, then spread the chunks on a parchment-lined baking sheet and dry at the lowest possible temperature, checking often. As for our beverage brews, we’ve come a long way since our earlier flavor experiments. Now we add our flavors during a second fermentation and our culture is much happier for it. The best results have been with fruit that we picked and froze for the winter…peach-ginger is such a welcome, happy taste of summer! For each half-gallon jar of poured-off kombucha, we add about 1 cup of fresh or frozen fruit and a tablespoon or so of minced candied ginger and let it ferment for another few days before straining again and bottling. 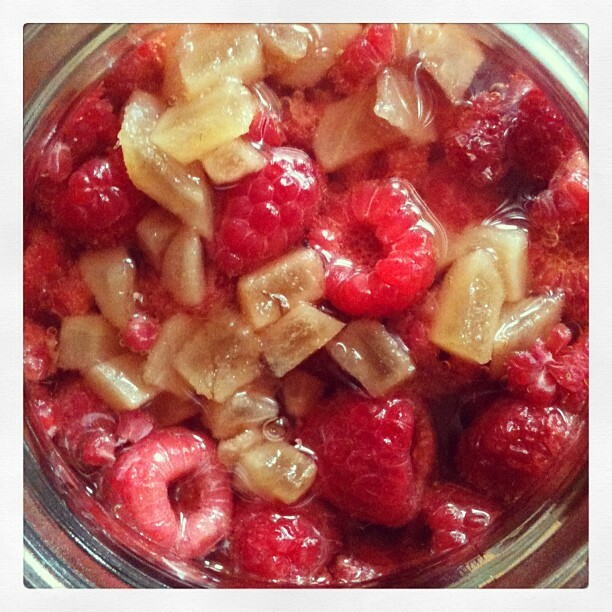 This entry was posted in fermentation, recipes and tagged kombucha by thespunmonkey. Bookmark the permalink. OH MY! Is this ever a tasty treat! I think I like them better than gummy bears, even. 🙂 I am so glad to have come across your mentioning it. I now have a great reason for keeping up with the kombucha! 🙂 Thanks for sharing this. Yay! I’m so glad you enjoy it…surprisingly delicious, eh? Thank you for the recipe!! Mine are in the dehydrator right now and I’m super excited to try them!! I made a coconut sugar simple syrup to marinate mine, can’t wait til they are done! I know dehydrating times depend on a lot of factors, but about how long did yours take?? I feel like I’m watching a pot of water, waiting for it to boil!! hehe. Thanks again! Oh, a coconut sugar syrup sounds perfect! And yes, dehydrating times do depend on a lot of factors. I don’t recall mine taking more than a few hours. It has now been a while since I made them, as I keep giving away my extra scobies! Basically, they should be gummy rather than gooey, and you don’t want to let them get to the point where they are hard and crunchy. Think gummy bears, and you’ve got it. Your first go-round will be a trial, and you should check on them often and keep track of how long and at what temp and then you’ll be good to go for next time. I hope you write back and let me know how they turned out! Well they came out AMAZING with the coconut sugar. They had a light, raisiny almost prune flavor to them, my DH said they were bland, but this is coming from the guy who will RARELY try my crazy kitchen experiments.They took a little longer than I thought they would, and I had some that were on the thicker that took overnight (I lowered the temp to 95 for night time) Me and my DD eat a few every morning, so we still have a couple hanging out in the fridge, but they’ve been a nice treat! Thanks again! I love the insanely hot cinnamon gummie bears. Anyone have recipe ideas for that intense flavor with a scoby! 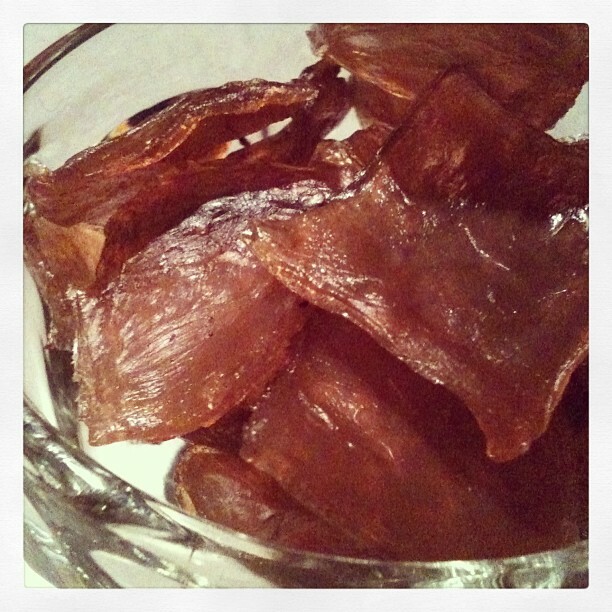 I am excited about the this candy, when marinating do we stick in the refrigerator? We are trying kombucha for the second time after many years. Our problem was not knowing how to cut the vinegar flavor enough to makes to more palatable. Your ginger peach sounds delicious. Are you willing to share? All I do for flavoring is add fresh or dried fruit in a second fermentation. So, in the case of ginger-peach, it was frozen peach slices and some candied ginger, added once I considered the kombucha “done.” This stays at room temp for a day or two before straining out the fruit, and then I put it in swing-top bottles and into the fridge, not that it lasts very long. If your kombucha has gone past to the point of being too vinegary to be palatable, I use it for marinating meat, as a conditioning rinse for my hair, or as I would use vinegar in house-cleaning. It can always be used for something, even if you don’t want to drink it! I hope that helps!